The pattern has long since been retired but the colors have been paired together on everything imaginable, from clothing to bedding ensembles and beyond. And now, brown and blue have broken the final frontier: wedding cake. I love this cake. It’s a three-tiered round cake covered in a chocolate brown fondant. 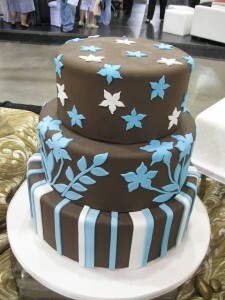 I personally love how each tier has a different blue fondant design as opposed to the popular alternating design. The cake was made for a bridal show by Amphora Bakery in Herndon & Vienna, Virginia.